So, you've come across a vintage typewriter and the paper won't feed properly, most likely the feed rollers are worn out or have flat spots. When I started looking on how to fix this problem I found a few websites that suggested using heat shrink tubing (which would require multiple layers) or sending them out to JJ Short Associates which I believe, is the only company who is left that will restore platens and rollers. Being the impatient person I am, sending them out wasn't on the top of my list and while using shrink wrap would be an option, I felt there must be a better way. This got me to thinking about using a polymer clay. I have quite a bit of experience making millefiore beads with a product called Fimo and I thought I would give it a try. It is easy to work with and is quite durable. I have restored quite a few feed rollers with no problems or complaints as of yet. You can find vintage typewriters and other helpful information on our blog @ Phat Dog Vintage! I prefer the Classic Fimo product as it seems to provide a more durable end result. You will have to spend some time softening it, but is worth it in the end. (You can usually find polymer clay at your local craft store). To soften, break off a chunk and warm it in your hands, knead it, stick it your bra, your pants, whatever you need to do to make it pliable. This may take some time, so be patient. Just don't put it in the microwave, you will have a crumbly mess. Obviously you have removed the platen and taken the feed rollers out of your typewriter. Use a caliper to measure the diameter of the original feed rollers. This is very important! Don't miss this step. Now remove the old rubber from the rollers. This should come off easily with an X-Acto blade or knife. A light sanding of the metal rods and wiping them clean will provide a nice start for the new material. Now it is time for the Fimo covering. Since it's been warmed and pliable (by whatever means you've used), you can now roll out the clay (like pie dough) to the desired thickness. This can be done by rolling it out with a rolling pin or a glass jar. Just be sure the thickness is consistent and fairly smooth. If you have a pasta machine, they work fabulous, just be sure to clean it well before making your next batch of fettuccine. Now you are ready to lay out the rollers and cut the fimo to size. Once you have the proper size and thickness wrap it up like an enchilada. All the food references…I must be hungry. Almost done! Now trim the ends and smooth out the seam. You can smooth out the seam with your fingers or gently roll the roller (like a log) on a smooth surface until the seam is no longer noticeable. Double check the diameter with your caliper to make sure the thickness is correct. If it is not, you can remove the clay, and go back and re-roll the clay until you have the right thickness. Now it is time to bake. Make sure you suspend the rollers while baking (do not place directly on baking sheet as this will cause a flat spot). I have used rolled up aluminum foil in the past. However, as you can see in the photo, I recently made permanent suspenders out of leftover clay. Fimo's baking directions: Let it harden in the oven for a maximum of 30 minutes at a temperature of 230°F. I tend to bake only about 18-20 minutes or so, as the metal rods heat up and "cook" the clay from the inside. So there you are! 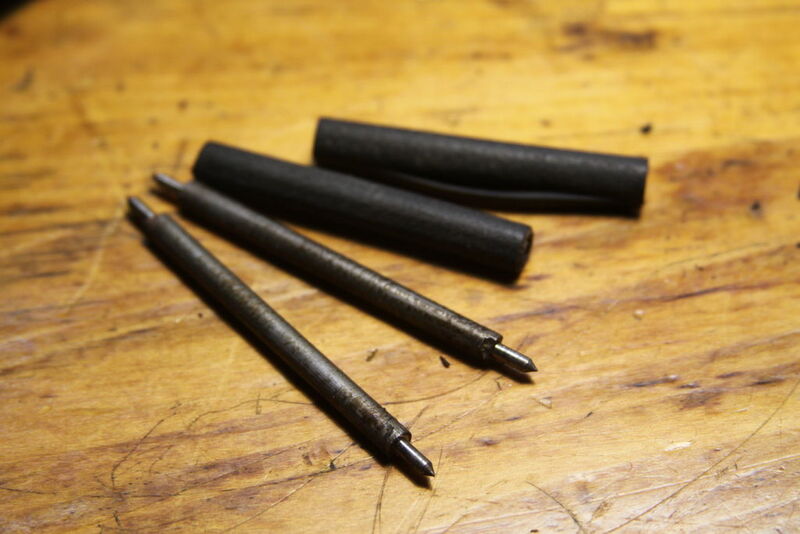 Let them cool (lightly sand with a super fine grit sandpaper if needed) and pop them back in your machine. Clever fix---will be curious to see how long it holds out. By the way JJ Short would charge $ 15 each for the Underwood feed shown in the picture---and it takes 1 week plus shipping to get back. Fantastic. really a good solution. I was thinking about having to find rubber tubing etc. but this seems simple..... well in my mind it is easy. Wow, this looks like a great fix! How to you ensure that the layer of clay is perfectly even around the metal rod? Is there a trick to that? If the clay is rolled out evenly, it should go around the rod evenly, and then trim the ends to fit. From there you can smooth out the seam with your fingers or roll the rod (like a log) gently on a smooth surface. If it's not right you can always start over. That's the beauty of polymer clay, you can always reshape it, until you bake it!